Shadow Home Secretary David Davis is calling on the government to scrap its "outdated" policy of multiculturalism. Allowing people of different cultures to settle without integrating let the "perverted values of suicide bombers" take root, he told the Daily Telegraph. The leadership hopeful urged ministers to build a single nation and demand "respect for the British way of life". The Muslim Council of Britain says there is no contradiction between multi-culturalism and integration. Mr Davis said he agreed with Trevor Phillips, the chairman of the Commission for Racial Equality, who last year said multiculturalism belonged to a different era. Mr Phillips said all citizens should "assert a core of Britishness". Mr Davis' remarks came after Home Office Minister Hazel Blears met Muslim leaders in Oldham in the first of a series of meetings to discuss concerns following the London bombings. In an article for the Daily Telegraph, he said: "We must speak openly of what we expect of those who settle here," he said. Non-Muslims had obligations to work for equal opportunities, accept the mainstream version of Islam as part of society, and reject racism. But Muslims had to confront terrorism, not just condemn it. Mr Davis said Muslims had to "root out" imams who failed to "understand the conventions of British society". He said: "We must acknowledge there are good imams and bad imams." He strongly criticised Birmingham Central Mosque chairman Mohammed Naseem for focusing his anger on the security services rather than the London bombers after one of the suspected terrorists was arrested in the city. Mr Davis said: "Searching questions now have to be asked about what has been happening inside Britain's Muslim communities and how the perverted values of the suicide bomber have been allowed to take root. "Britain has pursued a policy of multiculturalism - allowing people of different cultures to settle without expecting them to integrate into society. "Often the authorities have seemed more concerned with encouraging distinctive identities than with promoting common cultural values of nationhood." 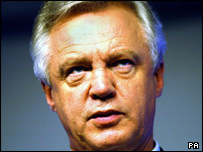 Mr Davis called for a new border control police force to secure Britain's "porous" borders and an urgent review of the process of granting British citizenship. The government should allow evidence from phone-taps to be used in court, argued Mr Davis. And ministers should consider scrapping the Human Rights Act if it stopped them from making Britain as safe as possible. Inayat Bunglawala, from the Muslim Council of Britain (MCB), said multiculturalism was not at odds with integration. "It is perfectly possible to be integrated in a wider British society while also holding onto your faith and values which you deem important," he said. "For example, it may be part of the wider way of life to get drunk on a Friday night but this is not something our faith encourages." Mr Bunglawala said being a good Muslim was complementary to being a good British citizen. The MCB supported integration but it should come in all sectors of life, he said, challenging Mr Davis to set an example by ensuring the Conservatives had a Muslim MP. He added: "Mainstream Muslim scholars in the UK have been teaching the true interpretation of Islam and combating extremist views and interpretations. "However, their task has not been helped by some of our government's actions. "The war against Iraq, which David Davis and the Conservatives strongly supported, has undoubtedly helped make the extremist message more palatable to some Muslim youths."